My Vindaloo shawl is done and it was such a wonderfully satisfying knit! Although I didn't get it done in time for the SLO Yarn Crawl this year, it proved to be a nice warm companion on my lap that kept me busy while waiting on customers during the crawl. 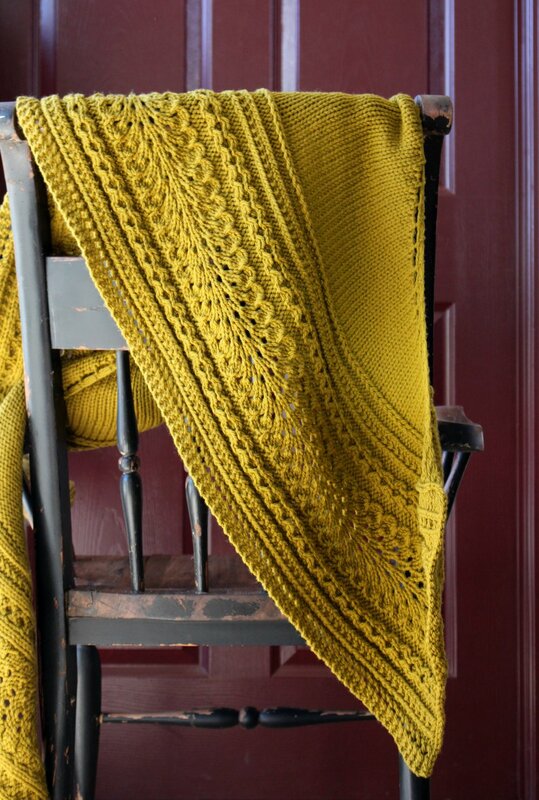 I absolutely love the texture of this shawl. I was sold on the combination of cables, eyelets and ribbing immediately. The pattern appears difficult at first, but I was able to memorize it after the first few repeats and work it without referencing the pattern. You ease into the shawl by enjoying a simple stockinette start with all of the complicated parts in the edging. This uses an applied edging technique where it is actually attached as you go along which is so nice. I am already getting use from my finished Vindaloo and I think it makes a beautiful and cozy Fall accessory!